Wednesday, July 18th, 6 PM: Town Hall Seattle (Seattle, WA), with Michael Ian Black and Meghan McCain Cancelled--IXNÆD by Meghan McCain! 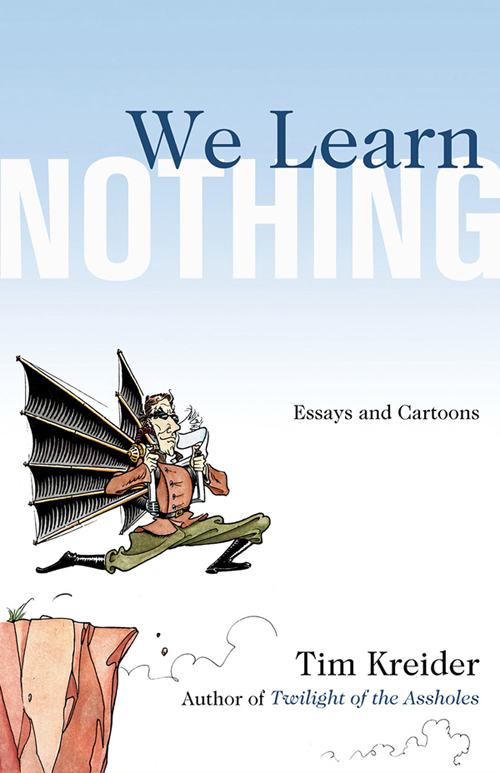 "Whether he is expressing himself in highly original cartoons that are hilarious visual poems, or in prose that exposes our self-delusions by the way he probes his own experience with candor, Tim Kreider is a writer-artist who brilliantly understands that every humorist at his best is a liberator. Because he is irreverent, makes us laugh, ruffles the feathers of the pretentious and the pompous, and keeps us honest, We Learn Nothing is a pleasure from its first page to the last."" "Kreider locates the right simile and the pith of situations as he carefully catalogues humanity's inventive and manifold ways of failing."